North Eastern Airways (IATA: 'NE, ICAO: NEA, CallSign: North East) is an American based airline that was founded by its current CEO Tyler Pinkerton on October 8th, 2007. Our first flight, NEA 75, was from Pittsburgh to Chicago with a leased 737-800 from Manchester International Airways. North Eastern Airways has since grown from a small airline based at Pittsburgh Intl Airport with one leased plane to an airline group with over 220 fully owned aircraft, 9 subsidiaries and 21 world wide hubs. Pittsburgh Intl Airport is North Eastern Airways largest hub with over 600 daily flights and is also North Eastern Cargo's largest hub with over 400 daily flights. North Eastern Airways is also a founding member of the World Alliance, the oldest airline alliance around and codes flights to the other 8 members of the alliance. North Eastern Airways is mainly a Boeing Aircraft group which includes MD and DC aircraft, but does have a small fleet of Airbus Aircraft that were acquired through mergers and will be kept. 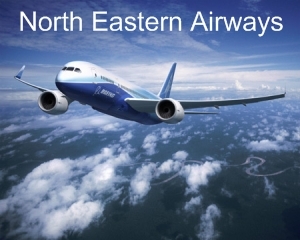 North Eastern Airways is the launch Customer for the Boeing 787 Family and 747-8 family of aircraft. EIS for North Eastern Airways' first 747-8F is Q4 2009. North Eastern Airways was founded by Tyler Pinkerton on October 8th, 2007 as a low cost carrier that was to be based at the Pittsburgh International Airport near Pittsburgh, PA. Our first flight, NEA 75 Pittsburgh-Chicago (O'Hare), was on October 9th, 2007 with our first aircraft, a leased Boeing 737-800 from Manchester International Airways (formerly Stanair). At the time, North Eastern Airways was flying strictly out of Pittsburgh International Airways as its only hub and only flights within the north eastern part of the country along with a few flights down south. On October 20th, 2007 we officially opened our cargo and express branch of the airline. On October 24th, 2007, our first cargo flight, NEC 1 Pittsburgh-Los Angeles, was flown with our own Boeing 747-400ERF. On October 26th, 2007, North Eastern Express flew its first flight, NEX 3411 Anchorage-Talketna, with our first Q400 we owned. Through our first couple of months of operations, we continued to expand our operations out of Pittsburgh to destinations reaching all the way to the west coast along with a few International flights to Europe and Asia. In mid November we officially opened up Ted-Stevens Anchorage Intl Airport as a focus city. Flights were started throughout the US to the airport and it became a connecting airport for flights into Asia. Throughout the end of 2007, NEA continued to grow its network and fleet. In early January, 2008, North Eastern Airways announced that it was bidding to taking over SkyJapan Airways who was in Bankruptcy. On January 16th, 2008, NEA announced that its creditors and unions had reached an agreement with SkyJapan Airways for the takeover and merger of the airline. North Eastern Airways would take control of the whole airline and would restart operations of SkyJapan. As a part of the agreement, NEA would move SJA's hub from Tokyo's Narita airport to its Handena airport in an effort to turn it profitable again. After the SJA merger, North Eastern Airways continued growing and on April 2nd, it announced that it was to become one of five founding airlines of the World Alliance. It would along with the other member connect the world with each other and allow passengers to fly almost anywhere in the world. Later that month on April 26th, 2008 announced that it would be opening up another hub, this time at Phoenix Sky harbor International Airport. On that same day NEA announced that they were in talks with British Airways Virtual Cargo over a possible merger of the two airlines. On May 9th, the two companies agreed upon a merger. North Eastern Airways would be in control of the new company while the old CEO of BAVC would become the Head of Cargo Operations. On that same day, North Eastern Cargo received the first Boeing 777-200LRF ever. On May 11th, the two airlines had successfully finished merging together. After the merge of BAVC, North Eastern Airways continued expanding its fleet and operation from its 2008 expansion plan. In summer 2008, NEA and NEC decided to retire the last of their 747-400s (400ER/400ERF). These planes would be replaced with the 777-300ER and 777-200LR respectively. At this time, the 777 family officially became the flagship aircraft of our entire airline. On October 7th, 2009, North Eastern Airways and DCA- Dutch Carribean Airlines begain talk of a merger between the two airlines with NEA taking over DCA. On October 9th, 2009, NEA officially took over control of DCA and their complete operations. October 10th, will see the first day of operations with the control in NEA's hands. Throughout the end of 2008 and all of 2009, North Eastern Airways continued its expansion and opened up 20 new hubs worldwide; 8 in North America, 5 in Europe, 5 in Asia/Oceania, 1 in South America and 1 in Africa. Along with these new hubs, NEA took delivery of over 100 aircraft to service these hubs. North Eastern Airways is now a 220 aircraft 21 hub strong world airline. North Eastern Airways is the main part of our airline group and it has three branches to it; North Eastern Airways, North Eastern Express and North Eastern Cargo. North Eastern Airways (ICAO: NEA) is the mainline part of the airline. It flys to over 500 destinations worldwide with a fleet of 82 aircraft. NEA uses 16 hubs worldwide and provides all the Hub-Hub services. North Eastern Express (ICAO: NEX) is the regional part of the airline. It flys to most of the cities in the US that NEA does for added capacity but also serves the smaller community airports that are too small for mainline service. NEX flys out of all the same hubs as NEA does. North Eastern Cargo (ICAO: NEC) is the cargo part of the airline. It flys to all of the cities that both NEA and NEX do with its own fleet of Boeing freighters. North Eastern Airways has 7 wholey owned subsidiaries around the world. All aircraft used come from NEA's or NEX's fleet and are counted as a part of NEA's or NEX's fleet. All aircraft are painted in the subsidiaries livery that they fly for. Air Italia (ICAO: AIT) is a small regional airline that is based in Naples Italy. It serves all of Italy with Domestic flights and International flights throughout Europe through one of four hubs. It uses Boeing 717 and Bombardier Q400 aircraft. The 717s are used on Hub-Hub flights along with all of the International flights while the Q400's are used for domestic flights. Fly Hawaii Express (ICAO: FHE) is a small airline based In the Hawaiian Islands that provides intra-island services along with certain flights to the mainland. It uses Boeing 717 and Bombardier Q400 for intra-island services and Boeing 757-200 aircraft for the few flights to the mainland. Every major airport in the Hawaiian Islands has direct flights to one another but Maui is the main hub for the airline with all flights to/from the mainland coming through here. Fly Dubai Airways (ICAO: FDA) is a Luxury airline that is based in Dubai, United Arab Emirates. It uses Boeing 777-200LRs and 777-300ERs along with an Airbus A380 to serve the most important cities of the world. Fly Tahiti Airways (ICAO: FTA) is a small airline that is based in Tahiti. It flies two Bombardier Q400s and a sole Q402PF (Package Freighter) aircraft throughout all of the small islands of the South Pacific. North Eastern Airways provides flights from FTA's hub to its Auckland Intl Hub in New Zealand for flights in/out of the whole region. FTA will also be receiving 2 Viking DHC-4-600 Amphibious aircraft for use into the sea bases in the area. Galaxy Aviation (ICAO: GAL) is a small bush airline that is based Fairbanks International Airport and Lake Hood Seabase in Alaska. It provides the people of alaska along with the tourists there with the needed air travel within the state and with the needed cargo for life. It owns its own fleet of 5 Beech 1900Ds, 5 Viking DHC-6-400, 2 Bombardier Q200, 2 Boeing 737-200QC and 2 Cessna 208B Grand Caravans. Historic North Eastern Airways (ICAO: HNEA) is a "Historic" version of North Eastern Airways who operates Domestic and International flights just as North Eastern Airways would have if they were from the mid 20th century time frame. This subsidiary flies only aircraft that came before the year 1980. Allegheny County Airport (ICAO: KAGC), Pittsburgh International Airport (Only International flights from the Pittsburgh region operate from here)(ICAO: KPIT) and Myrtle Beach International Airport (ICAO:KMYR) are the three hubs that HNEA flies out of. UK Connect (ICAO: UKC) is a European Regional Airline that is based at London City Airport (ICAO: EGLC) in London, England that flies to cities throughout Europe. The fleet is made up of four Bombardier Q400s along with three Embraer E195s. UK Connect offers both Business and Economy classes on all flights and serves the business people of Europe with direct flights right into the heart of London. Bombardier Q200 2 37 Alaska Former North Eastern Express Aircraft. This page was last modified on 24 December 2009, at 18:48.